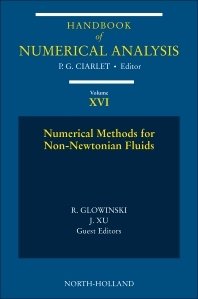 Non-Newtonian flows and their numerical simulations have generated an abundant literature, as well as many publications and references to which can be found in this volume’s articles. This abundance of publications can be explained by the fact that non-Newtonian fluids occur in many real life situations: the food industry, oil & gas industry, chemical, civil and mechanical engineering, the bio-Sciences, to name just a few. Mathematical and numerical analysis of non-Newtonian fluid flow models provide challenging problems to partial differential equations specialists and applied computational mathematicians alike. This volume offers investigations. Results and conclusions that will no doubt be useful to engineers and computational and applied mathematicians who are focused on various aspects of non-Newtonian Fluid Mechanics.